This is my very first zucchini. 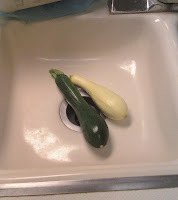 Those of you who can grow zucchini effortlessly are probably laughing right now. When I was young and lived in California, where everything grows, I didn't like zucchini so there was no reason to grow it. I tried growing it here in the desert because of the stories I had heard of how easy it was to grow and how I would be over run with zucchini. This is the fourth year that I have tried to grow it and FINALLY I got one. I'll probably only get one because I don't see anymore on the sad little plant. The yellow squash is doing much better. This is my second squash and more are coming. The rain and cooler weather are giving them a chance to grow. Next year, more shade and more water! 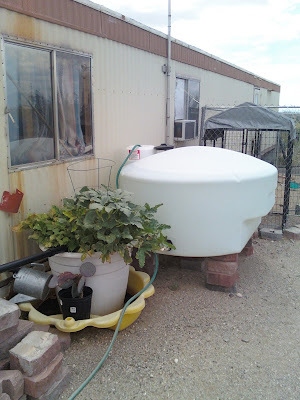 I spent most of this weekend moving rainwater from one container to the other. Now my 400 gallon tank by my mobile home is full. That should last me 8 weeks or more. The collection tanks at the garage are nearly empty and waiting for the next good storm. I've barely had a few drops this weekend but the clouds are all around. Time to get ready for a new week. I can't believe it is the last week of July already but I am glad it is. I should see rent money this week and then I can make my extra payment. Plus my boss is out of town again so I can wear jeans all week. If I get some rain too it will be a very good week. Squash grows like a weed here. I can't stand the stuff though. July has flown by here. Despite the intense heat here in the New York area this month, July has flown by for me. Then again, not having to exhaust myself going to and from work even two days a week makes every week go by pretty fast. Over the Cubicle, I never liked it until very recently and I am thrilled that I can actually eat something I grew. this desert gardening is hard. BTW, are you gonna write on your blog anymore? Inquiring minds want to know. Dave, that is definitely a reason to like the end of the month. I don't want time to go by fast once I'm semi-retired. It must slow down!